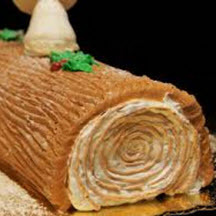 A Yule Log, or Bûche de Noël is a traditional Christmas cake shaped and decorated to look like a log. For Yule Log: Line greased jelly roll pan, 15 x 10-inches, with parchment paper; grease paper. Beat eggs at high speed in medium bowl 2 minutes; gradually beat in sugar until very thick and yellow colored, 3 to 5 minutes. Mix in water, orange extract and orange rind. Then, mix in combined flour, baking powder and salt. Spread batter evenly in prepared pan. Bake in a preheated oven at 375°F (190°C) until cake is golden and springs back when touched, 10 to 12 minutes. Loosen cake from sides of pan and immediately invert pan on kitchen towel sprinkled with powdered sugar; remove parchment paper. Roll up cake and towel, beginning at long edge; place on wire rack and cool completely. For Caramel-Orange Cream Cheese Buttercream: Heat sugar in medium saucepan over medium heat until sugar melts and turns golden, stirring occasionally (watch carefully, as sugar can burn easily) to make a caramel mixture. Add orange juice and rind and heat to boiling, stirring over medium heat to dissolve the previous caramel mixture. Strain and discard orange rind; return syrup to saucepan and cook to 230°F (110°C) on candy thermometer. Cool to room temperature. Beat cream cheese and butter until smooth. Beat in caramel mixture and powdered sugar until smooth and fluffy. To Assemble: Carefully unroll cake. Spread with 1 1/2 cups Caramel-Orange Cream Cheese Buttercream. Roll up cake; cut generous 1-inch slice of cake from each end. Place cake roll on serving plate and frost with remaining buttercream. Place cake ends on cake by attaching with wooden picks, and frost. Use tines of fork to make "bark" texture on frosting.